Live streaming has proven to be one of the most effective ways to get audiences engaged with online content and brands. If you want to take advantage of everything live video has to offer but don’t know where to start, this Beginner’s Guide to Live Streaming is for you. Learn all the basics of live streaming and start creating your live videos today. On Facebook alone, one out of every 5 videos is a live broadcast and viewers interact 6x more on live streams than videos on demand. Live videos are also able to retain people’s attention for 3x longer than traditional videos. Along with Facebook, there’s YouTube, which is a massive platform with 1.3 billion users, where 1 billion hours of video are watched daily. Plus many other live streaming platforms out there, like Twitch, YouNow, and Livestream. Regardless of the platform you choose, this Beginner’s Guide to Live Streaming can help you take the first steps towards creating live streaming videos. Live video is the perfect tool to increase your audience’s engagement because it allows you to interact with them in real-time. The high level of interaction during a live video is second to none. Expect for face-to-face interactions, naturally. But face-to-face meetings aren’t scalable. The interaction allowed by live streams can help you establish a deeper connection with your audience. When you’re live, you and your business become more relatable to your audience. Live streaming seems a bit scary at first. There are many technical aspects to it, and you’ll be in front of the camera, live. But, once you have a clear plan to follow and we go through some of its challenges on the tech side, it will be easier to overcome the fear of live streaming. By the end of this Beginner’s Guide to Live Streaming, you’ll be ready to start creating live videos to grow your business or personal brand. So, let’s dive in each of these topics. Having a goal in mind will make your life a lot easier when it comes to live streaming or any content creation. Live videos have many benefits to your business or personal brand, Most likely, you’ll be able to reap many of those benefits, but defining one specific goal can help you navigate the live stream better. For more tips on live streaming goals and content, check out The Ultimate Guide to Live Streaming Content. Which brings us to our next point, creating high-quality content, “High-quality” doesn’t mean you need state of the art equipment or to write a 50,000-word book. It means your content needs to bring A LOT of value to your audience and be relevant to them. That’s what it means. We could go on and on for days. To decide which one to use, think about your audience and go where they are. When in doubt, Facebook and YouTube are the safest bets. They are extremely popular and can help you reach your audience. You can also live stream to multiple platforms at the same time if you have enough internet bandwidth and hardware power. Speaking of internet, needless to say, it’s essential for live streaming. What you should know and focus on is your internet upload speed. Without getting too technical, the upload speed is what will carry the information from your computer to the world, so, the higher, the better. You can test your internet speed at Speedtest and make sure you focus on the upload speed. If it’s too low, you probably won’t be able to live stream. Tip: Wi-fi connections can be unstable, so choose an ethernet connection whenever possible. A live streaming application can help you create a more professional live video. 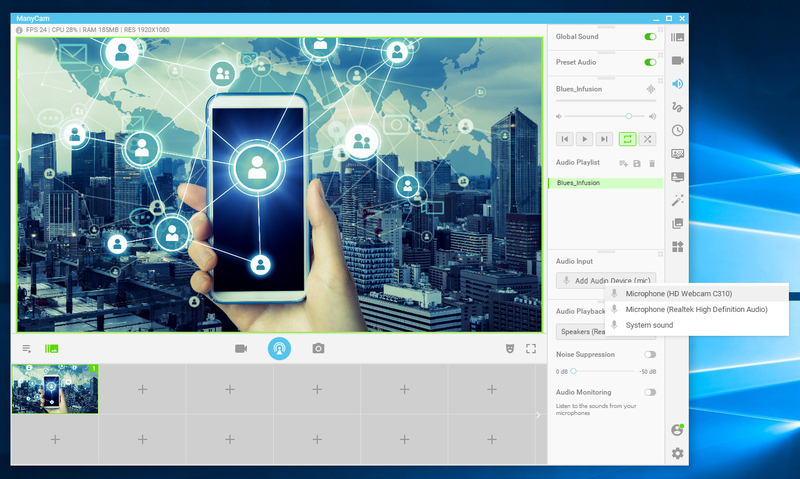 ManyCam, for example, makes it easy for you to adjust the settings and allows you to add multiple video sources, including your webcam, other cameras, pre-recorded videos, images, share your screen and much more. Download ManyCam for free here. The two main concerns regarding live streaming settings are the video and the audio. Believe it or not, audio quality is even more important than video. Viewers will forgive a slightly grainy image, but they won’t put up with noisy and unclear audio. For video settings, you’ll need to consider the video resolution which is the quality of the image. If you choose a higher resolution, let’s say 1080p, it means there will be more information to be transmitted, so you’ll use more resources and bandwidth. 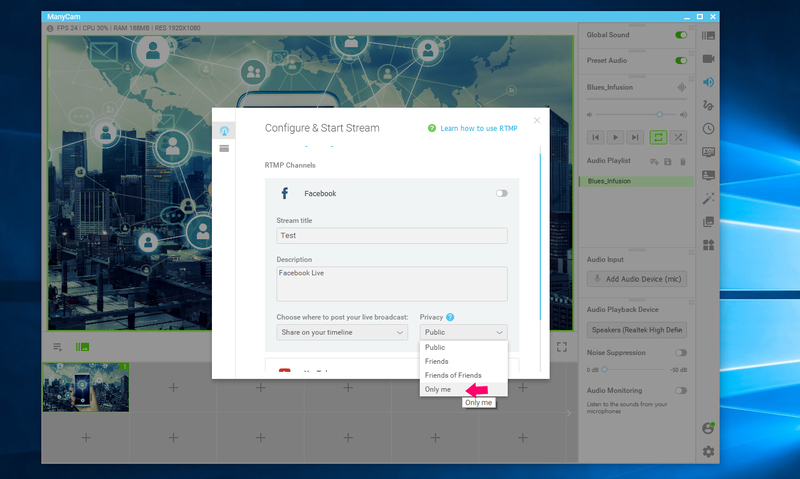 Check out this blog post for more information on Live Streaming Settings. Regarding your audio settings, if you broadcast with ManyCam, you’ll add your microphone as a source, and you’ll be able to record tests to make sure the quality is on point. More often than not, you’ll have to compromise video quality to obtain stream quality or vice-versa. Higher video resolution means your stream will take longer to buffer and viewers could experience some latency. In other words, there’s a delay and might freeze at times. On the other hand, higher stream quality requires more resources from your hardware and internet. The video will load faster for viewers, and they will get a more real-time experience, but you might need to use a lower resolution. Choosing what’s best for your live streaming video will depend on your primary goal. Do you need more real-time interaction or higher video quality? Enough of the technical stuff, now we’re getting to the exciting part – getting ready to go live. Here is a Facebook live tutorial, that can be applied to any major platform. When you open ManyCam, the first thing to do is add all the video sources you’ll need for your live video. For example, your webcam, your computer screen, media files, etc. On the Audio Tab, you can add your microphone and create a playlist if you want some music in the background. Hit the broadcast button, choose your platform and log in. Before you go live, we recommend doing a private live stream to test everything. You can choose to broadcast to your Facebook page on private mode inside the broadcasting options. You can use this time to rehearse your live video and make sure your content makes sense, and your settings are working. Another tip we need to mention in this Beginner’s Guide to Live Streaming, is to promote your live stream before going live. Let your audience know you’re going live and ask them to share it with their friends. If you have an email list, it’s a good idea to send them an email inviting them to watch your live video. Ok, now you can flip the switch in ManyCam and go live. This Beginner’s Guide to Live Streaming is a fantastic asset if you’re just starting out with online content and live video. But, look, live streaming is, well, live. So, mistakes are bound to happen. There’s always something that can go wrong. Having contingency plans and backup equipment is definitely a good idea. But, in the end, if something goes wrong, just apologize to the audience and move on. That’s really all you can do. Because it’s live, audiences tend to be more forgiving, and each time you go live, you’ll get better and better. 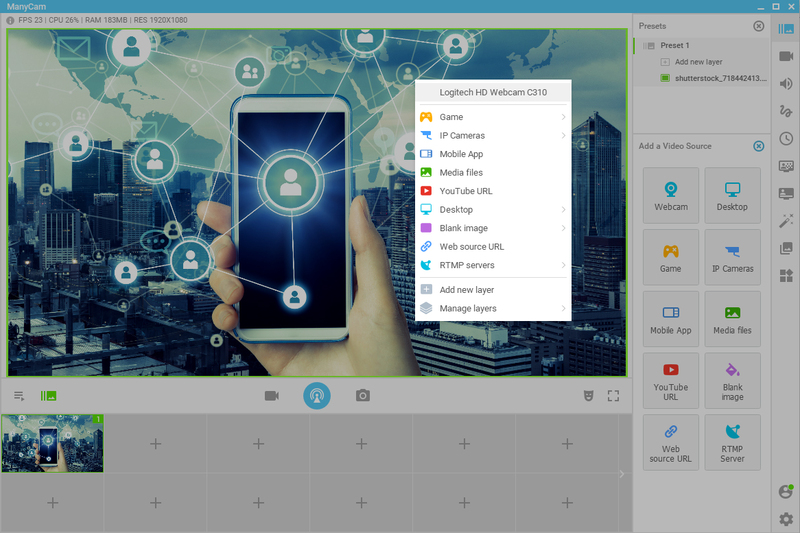 RTMP Ingest – What’s this new ManyCam feature and how can you use it?